Two decades after his death, Tupac Shakur is still relevant and a fixture in the headlines. From critically-acclaimed television programs to footwear collections, the “Hail Mary” rapper’s name and body of work live on. Now, a tangible part of Tupac’s legacy is making it ways to the auction block. 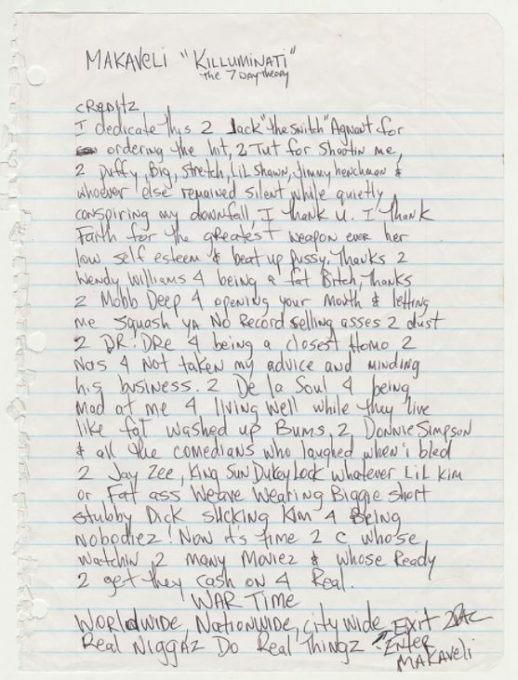 You can take a look at Tupac’s original handwritten liner notes for The Don Killuminati: The 7 Day Theory below. Late last year, FILA also released a Pac-inspired All Eyez on Me sneaker. An Official Look at the Air Jordan 1 Retro High OG "Shadow"
About an incompetent police force and their talking dog. Announced alongside two special editions. Sean Wotherspoon Teases Collaborative Capsule Alongside GUESS Jeans U.S.A.
For an upcoming Guess Farmers Market event. Supreme’s “Don’t Ask Me 4 Sh*t” stamp. Shoreline Mafia Dominates the Remix of AFN Peso's "Dough Hunting"
Plus, a new single with ALLBLACK.